Giving up sugar enables you to appreciate fruit. Fruit tastes so much better when you haven't had sugar for a while. As I’ve mentioned in a previous post, I’m dieting. The central focus of the diet is giving up refined sugar, starches, and flower – basically, removing any refined carbohydrate from your diet. That means, no white bread, pasta, potatoes, rice, cake, or sugar in all its myriad forms. What’s left is green/yellow vegetables (preferably raw), legumes, beans, nuts, seeds, and small amounts of lean meat such as chicken, turkey, lean beef, or fish. The diet was inspired by Joel Fuhrman’s book: Eat to Live. I can honestly say that the diet works well and is relatively easy to sustain because you don’t count calories and can eat as much as you want. The weight doesn’t come off fast, but rather melts off slowly. I have lost well over ten pounds in about two months. The diet is really more of a lifestyle change than a diet. Now that we’re “into it,” I don’t see us ever turning back. The health benefits are just too obvious. After about two weeks of no sugar or refined white flour, you begin to realize how addicting refined carbohydrate really is and how badly it makes you feel. Raw, refined, sugar and flour is the highest concentration of carbohydrate and as we all know, carbohydrate is energy – fuel for the body. If green plant-based carbohydrate were wood or coal, refined sugar would be gasoline or nitroglycerin. Wood and coal are slow burning, they release their energy over relatively long periods of time, gasoline or nitro, by contrast, goes up in a flash or an explosion. Eating refined sugar, or refined white flour is like pouring gasoline on your body’s metabolic fire. You get a huge immediate energy rush, then the fire goes out, creating a sugar depression. When we eat refined carbohydrate, we spike our blood with sugar. Our pancreas reacts to this “overdose” by secreting massive amounts of hormones, like insulin, to deal with these high levels of sugar. So stimulated is the pancreas to secrete hormones to metabolize these “unnaturally” high levels of carbohydrate, that it seems to overcompensate, quickly metabolizing every last molecule of sugar from our blood. What follows is a strong craving to eat again in order to re-establish a normal level of sugar in the blood. The result therefore of eating only plant-based carbs is more consistent sugar levels in the bloodstream. You get hungry, but not ravenous. It’s a hunger you can deal with. In my pre-diet days, I would nibble on anything in sight because I always felt hungry. Managing your metabolism by eating plant-based carbs allows you to reasonably manage your eating habits because you’re never “insanely” hungry. My thinking now is that I should eat, rather than I must eat. Detoxing from sugar and white flour had another interesting side effect. Fruit tastes good again. When I was young, I loved fruit. I fondly remembering eating apples, picked from trees in my Great Aunt’s yard and thinking how great they tasted. But over the years as I ate more refined forms of carbohydrate, I drifted away from fruit. It didn’t seem to taste good anymore. 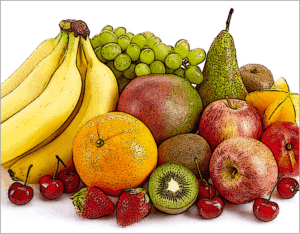 My current diet made me realize that when you eat massive amounts concentrated refined sugars on a daily basis such as sodas, cookies, candy, etc., fruit, even very sweet fruit like grapes, seem to taste sour by comparison. After “detoxing” from refined sugar for about two weeks, apples suddenly began to taste like a sweet treat again. Once again, I look forward to ending a meal with an apple, a banana, an orange, or the “bomb” of fruit sugar, pineapple. I still occasionally “fall off the wagon” and treat ourselves to dinner, dessert, or other sugary libation, but it’s much easier to abstain. It usually takes only a bite of something like cheesecake to get all the sugar “fix” necessary to remind you why you’re doing what you are doing. As time goes by, I’m not completely sure how this will all play out. All I can say is that presently, I’m feeling much better and I’m slowly losing weight, which is all good. More updates will follow.